Traveling through the Hamptons on eastern Long Island, Interstate 495 (Long Island Expressway [LIE]) takes on a rural feel with fewer trappings of urban society than the west end of the route in Manhattan. Photo taken 06/13/05. Interstate 495 in New York is the Long Island Expressway, or the L.I.E. to locals. Per the Official Description of Highway Touring Routes, etc. in New York State,1 I-495 exists in two portions: from the Queens-Midtown Tunnel to I-278 (Brooklyn Queens Expressway [BQE]) and from I-678 (Van Wyck Expressway) east to New York 25 at Riverhead. The portion of the LIE in between is referenced as New York 495. Despite the official mileage for Interstate 495 not including the portion of the LIE between the BQE and Van Wyck, I-495 is fully signed along the entire length of the Long Island Expressway. When first designated, Interstate 495 originated from I-95 in Secaucus, New Jersey and extended east into Midtown Manhattan via the tolled Lincoln Tunnel. Following the planned Mid Manhattan Expressway, I-495 was to connect with the Queens-Midtown Tunnel and the Long Island Expressway east to the Clearview Expressway (I-78 at the time). A controversial roadway, the Mid Manhattan Expressway was never built, leaving I-495 as a discontinuous route between Union City, New Jersey and Queens, New York. The portion from the Lincoln Highway west was subsequently decommissioned as an Interstate. 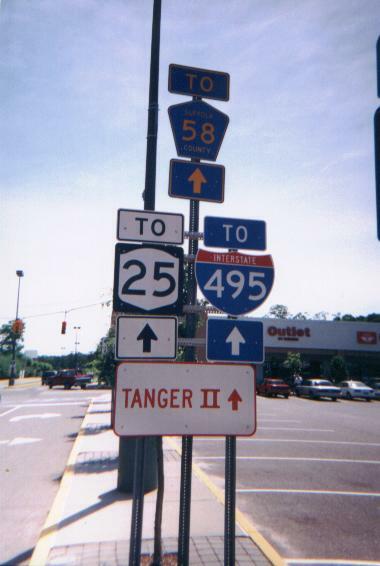 Trailblazers for I-495, NY 25 and CR 58 direct motorists eastward along Tanger Mall Drive from the Tanger Factory Outlet located beside the east end of the Long Island Expressway. Photo taken by Douglas Kerr (06/00). The last section of I-495 opened to traffic was the segment between Exit 71 (eastern New York 24) and Exit 73. Finished in the early 1970s, construction took about 15 years to complete. 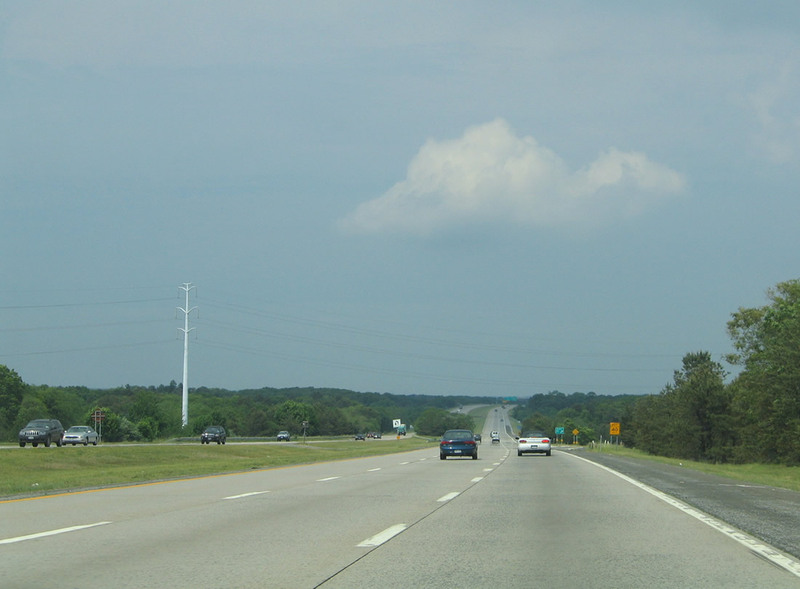 Prior to 1983, the Long Island Expressway east of Exit 27 (Clearview Expressway) was signed as New York State Route 495. The New York Congressional legislation led by then-Senator Alfonse D’Amato (R-NY) passed legislation at that time extending Interstate 495 east from the interchange with I-295 (Clearview Expressway) to the end of the expressway at Riverhead. AASHTO approved the extension at the meeting on May 23, 1984. There was also occasional discussion of extending the Long Island Expressway along the North Fork of Long Island, and possibly even across Long Island Sound to New London, Connecticut, or Watch Hill, Rhode Island. Proving to be very controversial, those efforts to plan and construct such a link failed to gain traction due to local efforts to preserve the rural character of Long Island’s East End. The final two exits along Interstate 495 east connect with NY 25 and CR 58 (Old Country Road). NY 25 leads four miles east to the Riverhead town center. Photo taken 06/13/05. A series of regulatory signs precede the eastern end of the Long Island Expressway. The freeway concludes at a partially built interchange with Old Country Road in a half mile. Photo taken 06/13/05. A half cloverleaf interchange (Exit 72) connects the Long Island Expressway with New York 25 to Riverton and Calverton. Photo taken 06/13/05. A lane drop occurs along the remainder of I-495 leading east from NY 25 to CR 58 (old Country Road) and Tanger Mall Drive at Exit 73. Photo taken 06/13/05. CR 58 (Old Country Road) runs across the north side of Riverhead along a commercial arterial, bypassing NY 25 south to the town center en route to Greenport and Orient. Photo taken 06/13/05. A loop ramp forms the westbound beginning of Interstate 495 (Long Island Expressway) from Suffolk County Route 58 (Old Country Road) westbound at Riverhead. Photo taken 06/13/05. Succeeding entrance ramps connect NY 25 (River Road) with I-495 west from CR 58 (Old Country Road). CR 58 merges with NY 25 at a wye interchange nearby en route to Calverton. Photo taken 06/13/05. Interstate 495 leads west into the Queens-Midtown Tunnel which connects with 34th and 39th Streets at Midtown Manhattan. Photo taken by Jim K. Georges (07/98). Former button copy signs acknowledging the Queens-Midtown Tunnel (New York 495) as Interstate 495 on FDR Drive southbound. Photo taken by Kevin Lagasse (05/27/01). Signage for the entrance to the Queens-Midtown Tunnel from East 34th street in Manhattan. The tunnel entrance lies two blocks to the north. An additional entrance is located at 39th Street. Photo taken by Kevin Lagasse (05/27/01). “The Dwight D. Eisenhower System of Interstate and Defense Highways,” Part V – Interstate Withdrawal-Substitution Program. Page updated May 21, 2015.